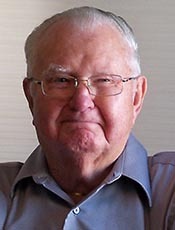 Harold Roland Eckhardt, 87, of Berthoud passed away on September 22, 2014 at the Medical Center of the Rockies. He was born February 16, 1927 in Greeley, Colorado to Pauline Eckhardt and Henry Meyer. He married Earlene Faye Nicks on June 11, 1950 in Johnstown, Colorado. Harold worked for Kerchoff Construction a few years and Pinkard Construction as a Superintendent for 33 years. He was a member of the Loveland Elks, a member of Sweetheart Sam’s Camping Club, and a board member of the Berthoud Senior Center. Harold enjoyed family, friends, dancing weekly, traveling, and walking. He is survived by his daughters, Faebian Leigh Baker and husband Roger of Windsor, Geraldine “Gerri” Faye Steinbaugh and husband Dale of Loveland; four grandchildren, Dorene Thorgesen and husband Lars, Leanne Baker, Nicholas Steinbaugh and wife Nhu, Taylor Steinbaugh; and two great grandchildren, Olivia Thorgesen and Felix Steinbaugh; two half sisters, a half brother, 2 sisters-in-law and several nieces and nephews. Harold was preceded in death by his parents, his wife, Earlene (Nicks) Eckhardt, a nephew and three brother-in-laws. Cremation has been conducted. A memorial service will commence on October 7, 2014 at 1:00 at First Christian Church, 2000 N Lincoln Avenue, Loveland. Site contents copyright © 2019 Recorder Online	except as noted. All rights reserved. | 87 queries in 1.089 seconds.